Why call a geek when you can hire a pro! I am not going to re-invent the wheel here. See these two blogs for info on initial setup on the PowerConnect and Radius server. There are two things that are not mentioned or only mentioned by visitors in the comments. After both of these changes were implemented, we were able to successfully authenticate with radius. 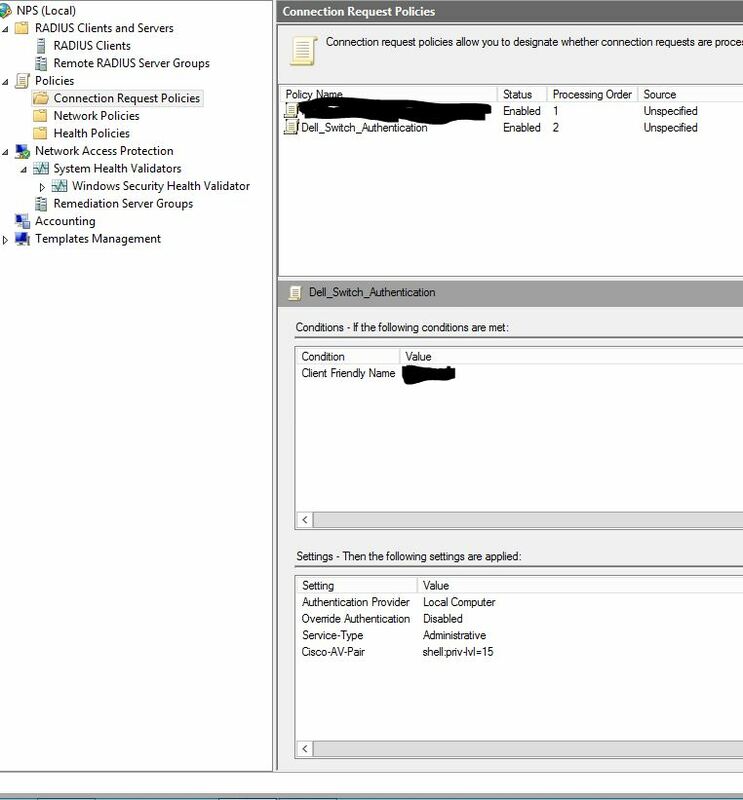 Hopefully these steps help you in your quest to use radius authenticate on your Dell PowerConnect Switch! Turn on TLS 1.0, TLS 1.1, and TLS 1.2 in Advanced settings and try connecting to again. If this error persists, it is possible that this site uses an unsupported protocol. Please contact the site administrator. This was on a site that should not have caused any issues, Southwest Airlines. A quick check showed that SSL3 and TLS 1.0 were both enabled but nothing else. SSLv3 and TLS 1.0 are insecure and with SSLv3 being fully deprecated. 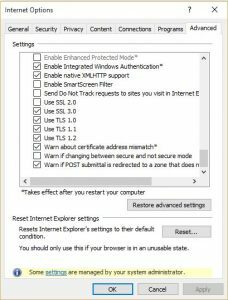 A change was needed however their needs required keeping the settings in place and adding TLS 1.1 and TLS 1.2 in as accessible without causing issues to end users. There are two ways to go about this. 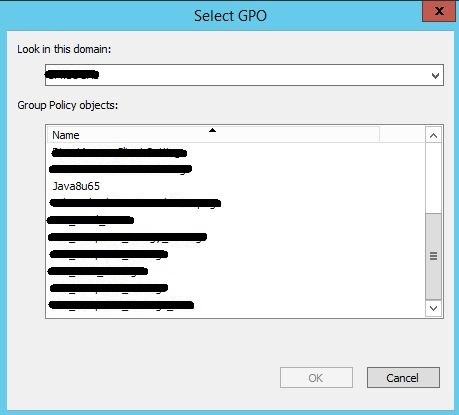 One is through Group Policy User Preferences and the other is through hardened Computer Policies. While both accomplish the same goal, they do so in different ways. If you require the users be able to disable or re-enable other versions and you simply want to set defaults, User Preferences will be your recommendation. If you are looking for something more secure and unchangeable, go with computer policies. If your requirements put your solution as User Preferences, open Group Policy management and either create a new policy or edit an existing policy. Make sure your policy is linked appropriately. 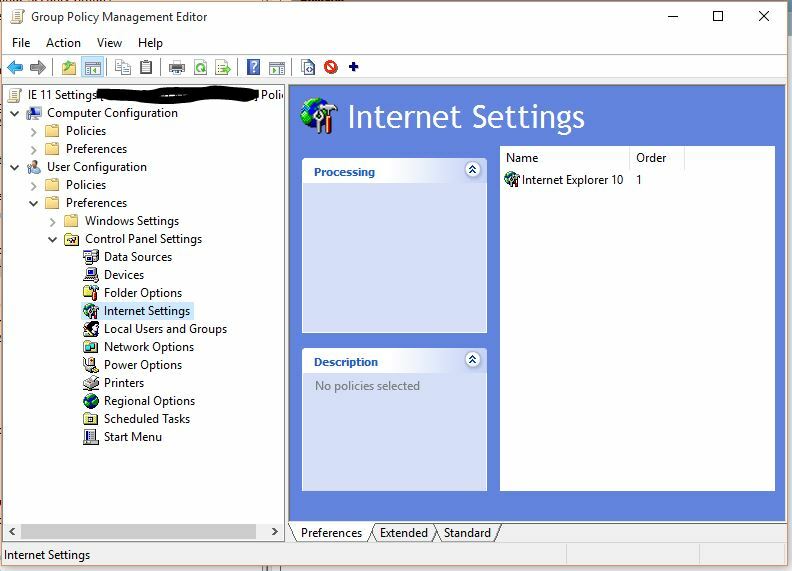 Next navigate to User Configuration -> Preferences -> Control Panel Settings -> Internet Settings and Create or Edit an Internet Explorer 10 setting. Once opened, go to Advanced tab and select the versions you wish to add or subtract. 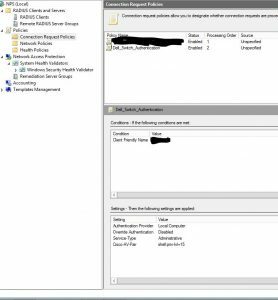 Apply and perform a group policy update on an end point and user covered by this group policy and verify the settings have been updated. 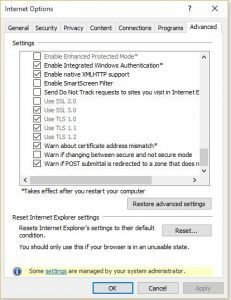 You will notice that the settings have been updated but remember, these are preference and not hard settings. An end user can make adjustments and changes that can not be fully controlled after the setting is applied. 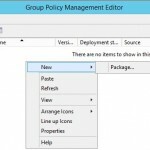 If you requirements put your solution as Computer Policy, open Group Policy management and either create a new policy or edit an existing policy. Make sure your policy is linked appropriately. 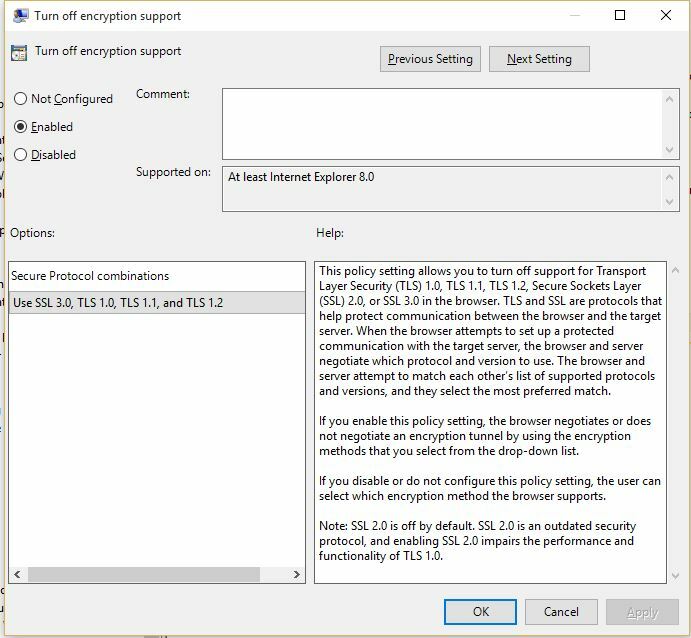 Navigate to Computer Configuration -> Policies -> Administrative Templates -> Windows Components -> Internet Explorer -> Internet Control Panel -> Advanced Page and find “Turn off encryption support.” While this name sounds scary, never fear as you are only turning off encryption support as you see fit and ensuring only those protocols that you deem needed are enabled! 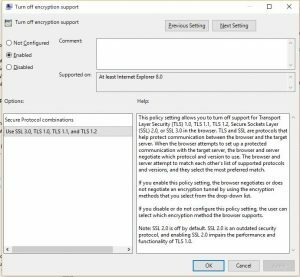 Enable the setting if it is not already enabled and then select the combination of security Protocols you wish to use, in this case SSL 3.0, TLS 1.0, TLS 1.1, and TLS 1.2. 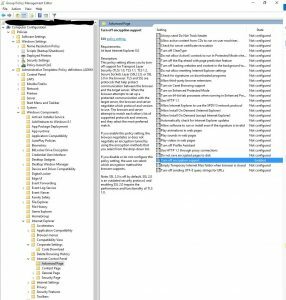 Apply and perform a group policy update on an end point covered by this group policy and verify the settings have been updated. You will notice that the settings have been updated and can not be changed. This will prevent users from select insecure or unneeded protocols. 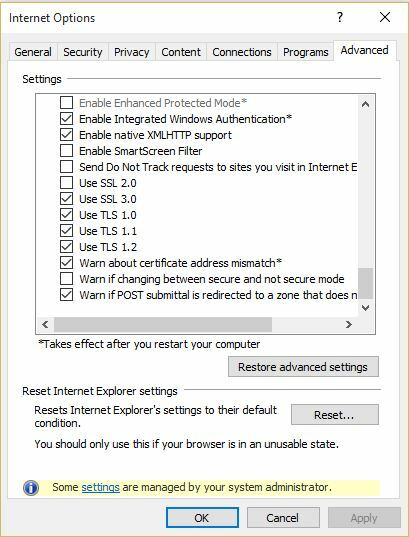 Hopefully you are able to use these settings to help enforce security across your organization. 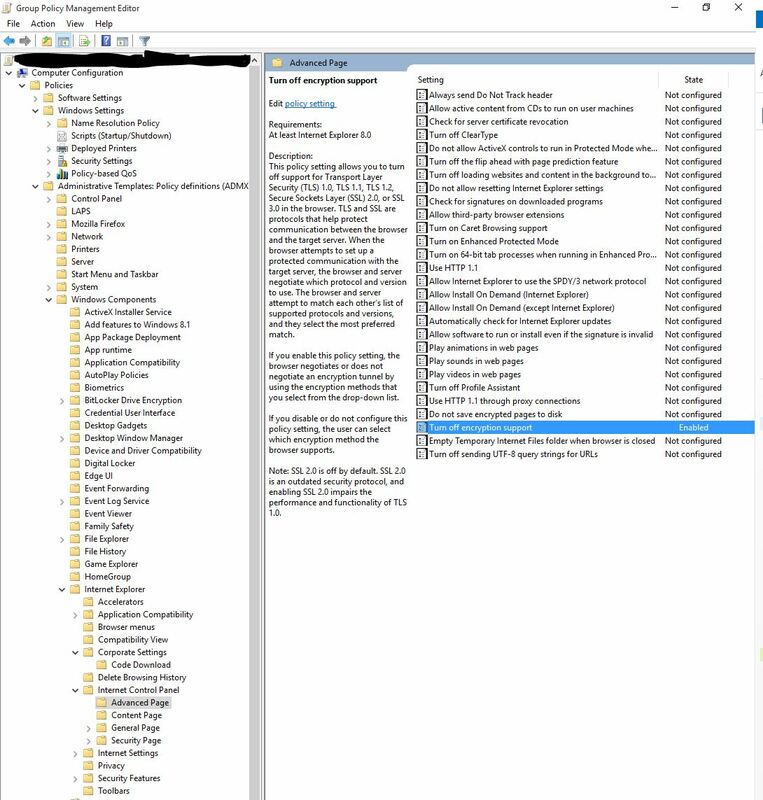 Last week, I described how to deploy Java via Group Policy. 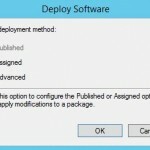 When this isn’t an option, you will be turning to a deployment program / service or scripting. In this point, I will go into details on how to script this deployment from a location that is accessible on your network. Please take this advice and make it your own and fit it to your design needs. 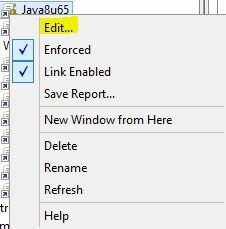 echo %computername% errored on %date% at %time%>>"\\server\Share\Java\failedinstalls.txt"
For all of this, you need to make sure that your method of deployment has access to the shared location. You will also want to make sure that the correct files are all living next to each other just as mentioned in previous posts. Once tested in your environment, you should be able to use your favorite method of deployment to successfully upgrade to the newest version of Java. Please share and comment if you were able to use this information in a successful deployment! Today we had a remote site report that two computers had limited to no connectivity. The issue lead to the site’s DHCP / DNS server. DHCP was no longer authorized and the DNS server would not come up. After DHCP was re-authorized, DNS still had issues. The server happened to the a server core install which added a further wrinkle to troubleshooting. 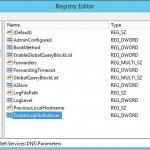 Event 2204, DNS-Server_Service - The registry value HKEY_LOCAL_MACHINE\SYSTEM\CurrentControlSet\Services\DNS\Parameters\EnableLogFileRollover contains an invalid value or could not be read. The DNS server cannot start. You must change this value to valid data or delete it and then attempt to restart the DNS service. Event 3152, DNS-Server_Service - The DNS server was unable to open file c:\windows\system32\logfiles\dns\dns.log for write. Most likely the file is a zone file that is already open. Close the zone file and re-initiate zone write. Research into the issue pointed to making a change with PowerShell. This site describes fixing the same issue with PowerShell. However the powershell cmdlets did not work. A quick check with Microsoft showed the command should have been working. In our case, the entry did not exist. Adding the entry allowed for DNS to successfully load and resolved all of out issues. Hopefully this information is helpful for those that are looking to resolve a similar issue. Last week, I described how to prepare for deployment of Java to an organization. With those pieces, we were able to deploy the software silently in several different ways. 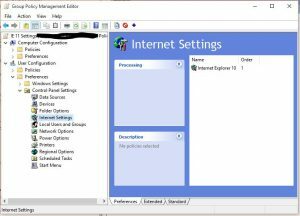 In this post, I will go into the details on how we deployed software with Group Policy. First stop would be to upload the files to a location. 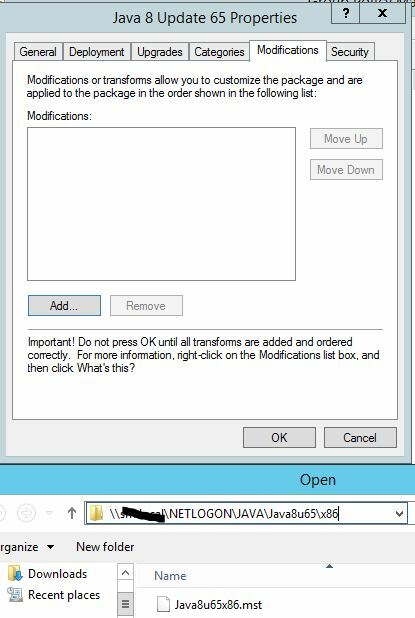 We deployed to a smaller organization and simply used the location \\TheDomain\NETLOGON and created a folder for Java with a folder under that for versions and an additional folder for both x86 and x64. This may be overkill for your needs but helps with separation and troubleshooting in the future. This also gives you the ability to add another version prior to removing a previous version, which is discussed at the end of this post. Once the folders are created, upload the .MSI, .MST, and .CFG files for each installation to the appropriate locations. 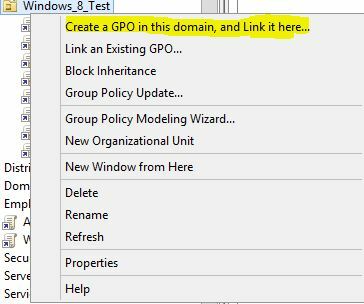 Name the new GPO and leave Source Starter GPO as none. A window will appear and you will be able to select the MSI package for Java. 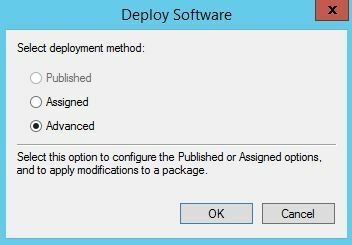 At Deploy Software, select Advanced and push OK.
Next, go to the Modifications tab and click Add. Navigate to the MST file and click OK to open. Select OK one more time and you have selected this version of Java. 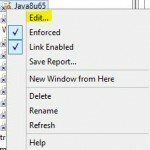 A popup gives you an option to select the newly created Java GPO. Now that you have deployed the software, what happens next week when either Java releases a new version or you are ready to move to the next supported version? 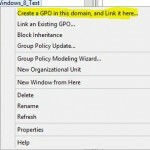 To start, leave the original GPO in place until you are ready to replace that version in production. This will prevent the software from being “Upgraded” which can cause issues. It also ensures that you don’t push the next versions directly to production when it should be tested first. Assuming you have tested and deployed a new version, we can now navigate to the old version. We did not upgrade any elements so there should be no dependencies to cause issues. 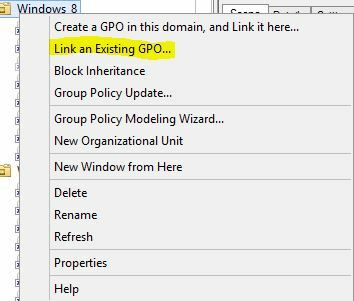 You are also protected if the computer goes to a different OU that has a different version as it will uninstall since we selected the “Uninstall this application when it falls out of the scope of management.” To uninstall, right click and edit the desired version’s GPO. 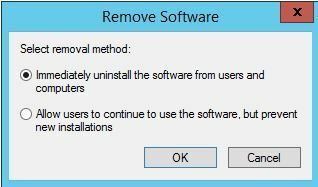 Navigate to the software to be uninstall by going to Computer Configuration –> Policies –> Software Settings –> Software installation. From there, right click and choose All Tasks –> Remove. 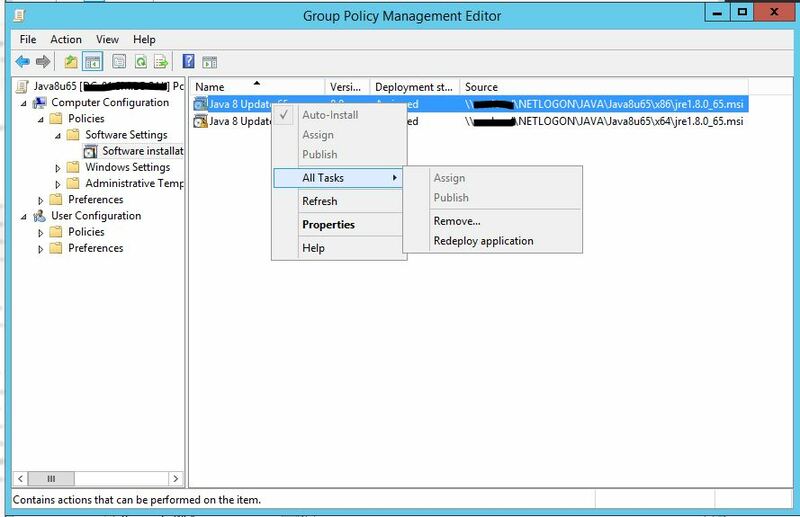 Once the policy has replicated to all sites, again force a Group Policy to update on the endpoint and restart. The software should uninstall prior to login. A few words of advice and caution. First, this will work if you are using a Direct Access VPN, computer authenticated wireless LAN or wired LAN. Direct Access VPN works best with Windows 8.1 or better. 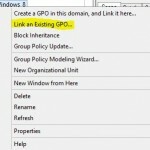 Second, deploying through GPO can cause slowness upon startup for users. 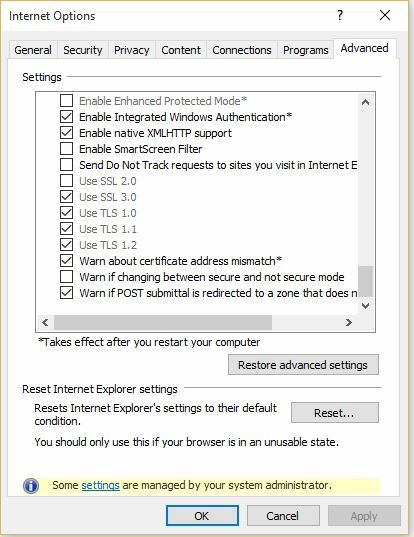 This is hardly noticed upon a modern LAN but can be significant on older WLANs or on slower Direct Access VPN connections. 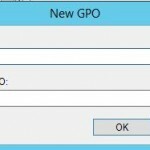 Third, try to avoid upgrading from version to version within the same GPO. I discovered that the version that was upgraded from did not uninstall. Fourth, this deployment style works well but do not provide easily accessible reporting nor a way to remove all previous versions. 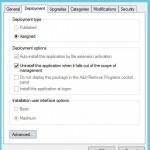 You can use WMIC commands to remove software BUT you are not able to easily remove and deploy all in one place. Lastly, I can’t stress how important testing is before large scale deployments. Testing will help prevent end user complaints as well as extra time for IT staff. Thanks for viewing and stay tuned from a scripted version that can accomplish a remove of ALL previous versions prior to installation of new version. Please comment if you have questions, comments, or requests! Previously, I described how to uninstall Java. Now that you have uninstalled Java, you need to install the most recent release. While the uninstall was discovered largely in house, we had to search Google to complete the task properly. which was silent. This may suit your needs but we found that this did not meet the needs of the organization. The install is silent, it did not prevent auto updating and all of the other pesky pieces of Java. Because of this, we decided to prepare a proper solution and at this point seek further assistance. You will need a software for MSI DB editing. We used Orca. 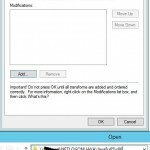 The change to the CustomAction – installexe – Value=3090 and I have confirmed that it does work on JRE8u65 x86 & x64. I would also recommend generating a transform and applying it to the MSI and not just editing the MSI directly. While editing the MSI directly means you don’t have to apply a transform, it increases the risk of issues with the MSI and needing to keep or retrieve the version at a later date. Following the guidance provided in the above sites, we were able to prepare a silent install package. We were also able to confirm that the procedures work for JRE8u65 x86 & x64. In the next article, I will discuss deployment option to ensure success within your environment. Recently I was tasked with updating the organizations Java. 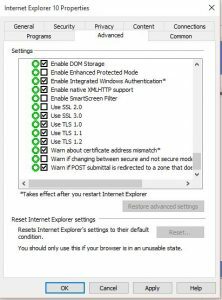 With the help of some colleagues and Google, we were able to put together a fully functional and silent uninstall of all previous versions prior to installation of the newest version. In this edition, we will discuss the uninstall. 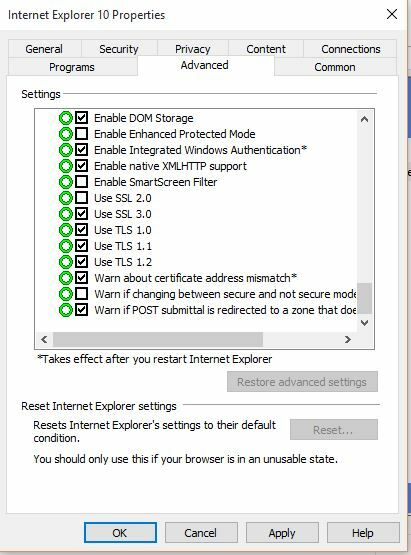 First, let me preface this caution as some of these commands can cause issues with running or install programs if proper testing is not performed prior to deployment. The first step to uninstalling Java is stopping any programs that might currently be using the software. This is a starting point to which you can expand depending on the applications used in your environment. These commands will stop all the above processes instantly and without option to save. 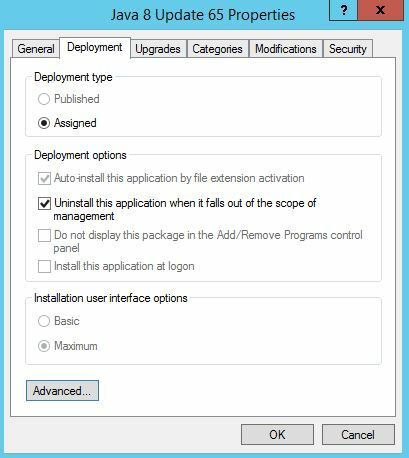 This can be used to force an install or prevent users from starting a program with installation is performed upon login. which will uninstall ALL versions of Java, both x86 and x64. 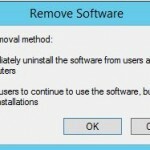 which will uninstall ALL Java 8 version, both x86 and x64. Please check back soon for part 2 in which we silently install the most recent version of Java, JRE8u65. Welcome to Schwenk Solutions Technology blog. Here we will discuss information that we find interesting or how-to articles from everything from general web safety to more complex enterprise setups. Hopefully you will find the information here helpful.